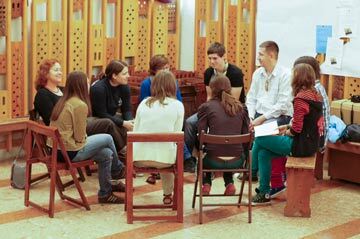 From 28 April to 1 May 2012, an international meeting for young adults was held in the Slovenian capital. This new stage of the pilgrimage of trust on earth enabled young people from numerous countries to experience Slovenian hospitality and to deepen their faith. On the banks of the Ljubljanica, the first real days of spring gave a fine impression of serenity to the pedestrian city centre. As in a mosaic, each of the participants, volunteers, and Christians of the city contributed their touch of colour and the diversity of countries, generations, cultures and Christian denominations gave a real idea of the universality of the Church. For some, this meeting recalled a previous gathering held twenty-five years ago in the same city. Brother Alois referred to it in his meditation on the first evening. We are now living in Ljubljana a new stage of the “pilgrimage of trust on earth”. It is good to remind ourselves that the pilgrimage began a long time ago and to remember in particular the stage 25 years ago in which the parents of some of you took part. And we do not forget that Brother Roger had already made a first visit to Slovenia, for a beautiful meeting in Stična. Meanwhile, we have been led on the way of liberty. Even if this path is sometimes hard, and filled with obstacles, we want to renew our gratitude for that liberty, and go forward courageously. I am still touched by the precious conversations with my host, the encounters in the workshops and obviously the prayers with so many young people from many places. I grew up in Villach, a town very close to the frontier with Slovenia. As a child, I experienced the confrontations that took place in the 1990s. I saw the tanks taking up their positions on the top of the mountains, soldiers passing through Villach, my parents and older people becoming nervous. Today I am welcomed with great hospitality in a free and democratic country. In God everything is possible – borders can be overcome, even in the darkest moments. He is with us; a life in communion is possible. This time we decided to travel by hitchhiking. It took us 26 hours to get to Ljubljana from Krakow. It was a great opportunity to trust the people we had to rely on during our journey. 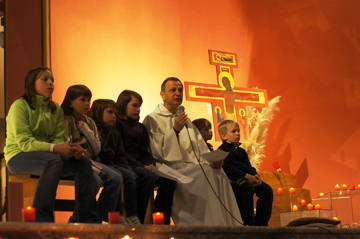 We could tell them what Taizé is, share our testimony and explain what had led us to take part in this meeting. Right from the beginning of the preparation for the meeting, I was enthusiastic about the idea od welcoming young Christians, praying with them, and rejoicing in their hope, faith and trust. However, as the coordinator for my parish, my first occupation was to find host families for all the pilgrims and I was touched by the openness of the families who often had to give up their holiday so as to be able to welcome the young people. When the first pilgrims arrived and the hosts came to pick them up, the genuine enthusiasm on both sides was a true sign of God’s blessing. Firstly, I would like to thank the host family and parishes for their kindness and hospitality. The meeting was a unique experience for a New-Zealander like myself. It was both interesting and enlightening to learn from and experience Slovenian culture as well as fellowship with youth from all over Europe. Being from a Protestant background, for me the most striking learning point from the meeting was the common love and values that we all share as Christians. I have certainly tasted a true sense of community and solidarity among the youth who I met at the Ljubljana meeting. This meeting in Ljubljana reminds me of my first European meeting in Zagreb, Croatia. People are very open and very welcoming. I can feel that the bonds in the family and community are very strong. Especially in my host family, I can see a real love in the parents and the fruit this bears in their children. My time here in Ljubljana was important for me. I experienced a heartfelt friendship and sensed very much that I was really welcome. For example, in my host family, conversation was not always easy because of the language, but I shared a very good time with them, because the atmosphere was so warm. Each day, there was Morning Prayer in the city churches. 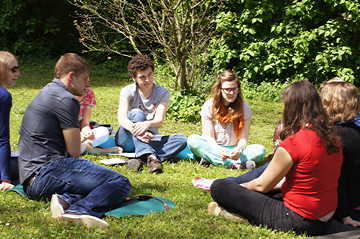 Afterwards, small sharing groups allowed the young people to deepen their reflection based on texts from Scripture and the themes of the « Letter 2012 Towards a new solidarity ». 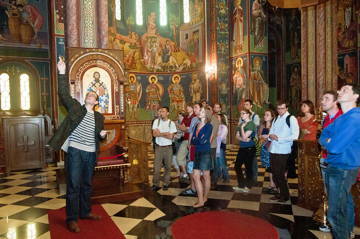 In the afternoons, several workshops were proposed to all the young people and to the Christians of the city: based on themes linked to faith, art and social life. Among the proposals: a guided visit to the Serbian Orthodox Church, the testimony of someone who had been deported, a meeting with a L’Arche household, a time of sharing with the Little Sisters of Jesus who are living in Ljubljana and in Zagreb. People involved in society and political leaders showed their support of the meeting by their presence, and young people from different countries were welcomed at the City Hall for an informal meeting. During these few days in Ljubjana, I rediscovered the atmosphere of prayer, of singing, and of silence of the Taizé Community. Whatever the place, it is always wonderful to sing among so many young people. Praying in Slovenian is an extraordinary experience I am not ready to forget. During these days, I was able to think of the mystery and of the joy of being a community in Christ. It is a mystery because each one is accepted as he or she is; it is joy, because in being part of this body I have the hope that I will not lose those whom I know and meet in my life. These days have been full of new meetings and of the joy of living together in unity.